Henrico County (formerly Henrico Shire) /hɛnˈraɪkoʊ/, officially the County of Henrico, is a county in the Commonwealth of Virginia in the United States. As of the 2010 census, the population was 306,935. In 2015, the population was estimated to be 320,717, making it the fifth-most populous county in Virginia and the sixth-most populous county-equivalent in Virginia. Henrico County is included in the Greater Richmond Region. There is no incorporated community within Henrico County, therefore, there is no incorporated county seat either. Laurel, an unincorporated CDP, serves this function. The Old Henrico County Courthouse in Richmond. Not to be confused with Henry County, Virginia. Named after the Citie of Henricus, Henrico was organized as one of the eight original Shires of Virginia in 1634. It is one of the United States' oldest counties. The City of Richmond was officially part of Henrico County until 1842, when it became a fully independent city. The present-day Henrico County curves around the City of Richmond, surrounding it to the west, the north, and the east. The county is bounded by the Chickahominy River to the north and the James River and Richmond to the south. Richmond Raceway is in the central portion of Henrico County near Mechanicsville, just north of the Richmond city limits. The raceway seats approximately 60,000 people and holds two NASCAR doubleheader race weekends per year. Additionally, Richmond International Airport is located in the eastern portion of Henrico County in Sandston. Top private employers in the county include Capital One, Bon Secours Richmond Health System, and Anthem. In 1611, Thomas Dale founded the Citie of Henricus on a peninsula in the James River that is now called Farrar's Island. Henricus was named for Henry Frederick, Prince of Wales, but it was destroyed during the Indian massacre of 1622, during which Native American warriors attacked the English settlers to drive them from the area. In 1634, Henrico Shire was one of the eight original Shires of Virginia established in the Virginia Colony. Since then, 10 counties and three independent cities have been formed from the original territory of Henrico Shire. Since becoming independent in 1842, the City of Richmond has successfully annexed portions of Henrico five times. Chesterfield County annexed the site of Henricus in 1922. Richmond attempted to completely merge with Henrico in 1961, but 61% of the votes in a referendum in Henrico county voted against the merger. In 1965, Richmond attempted to annex 145 square miles of Henrico County. However, after a lengthy court battle, the city was given permission to annex only 17 square miles. Since the city would have had to reimburse Henrico a hefty $55 million, Richmond opted against annexing the 17 square miles. In 1981, the Virginia General Assembly placed a moratorium on all annexations throughout the state. Henrico's borders have not changed since Richmond's 1942 annexation. The original county seat was at Varina, at the Varina Farms plantation across the James River from Henricus. Colonist John Rolfe built this plantation, where he lived with his wife, Pocahontas. Henrico's government was located at Varina from around 1640 until 1752. In 1752, Henrico relocated its seat to a more central location inside the city of Richmond, between Church Hill and what is now Tobacco Row. The county seat remained at 22nd and Main St in Richmond even after the city's government became fully independent of the county in 1842. It was not until 1974 when the county moved out of the Old Henrico County Courthouse to a complex in the western portion of the county at the intersection of Parham Road and Hungary Springs Road in Laurel. In addition to the 1974 complex, in 1988 the county opened its Eastern Government Center to be more convenient to county residents in the eastern portion of the county. It is located on Nine Mile Road. 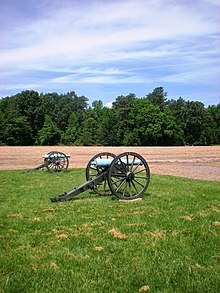 Additional significant battles took place in 1864 during the Overland Campaign prior to and during the Siege of Petersburg, which led to the fall of Richmond. Confederate General J.E.B. Stuart was mortally wounded in Henrico County at the Battle of Yellow Tavern on May 12, 1864. Henrico County is one of only two counties in Virginia that maintains its own roads, with the other being Arlington County. This special status was due to the existence of county highway departments prior to the creation in 1927 of the state agency that is now VDOT; and the assumption by that agency in 1932 of local roads in most counties. (Henrico and Arlington were grandfathered and allowed to continue pre-existing arrangements.) The control of the roads system is considered a powerful advantage for community urban planners, who can require developers to contribute to funding needed for road needs serving the planners' and developers' projects. Henrico County is the site of Richmond International Airport. It hosts an Amtrak rail passenger station. It purchases public bus route services from Greater Richmond Transit Company, an FTA-funded public service company that is owned equally by the City of Richmond and neighboring Chesterfield County. After Reconstruction, Henrico County used Convict lease to build roads in 1878. Some old roads continue to be in use today, such as Horsepen Rd., Three Chopt Rd., and Quiocassin Rd. According to the U.S. Census Bureau, the county has a total area of 245 square miles (630 km2), of which 234 square miles (610 km2) is land and 11 square miles (28 km2) (4.6%) is water. Henrico County is located in the Humid Subtropical Climate Zone and has hot and humid summers with moderately cold winters. Henrico County on average has 8 snow days. Henrico County has 88 days when the low falls below freezing, 50 days when the high exceeds 90 degrees, and 8 days when the high does not exceed freezing. As of the census of 2000, there were 262,300 people, 108,121 households, and 69,846 families residing in the county. The population density was 1,102 people per square mile (425/km²). There were 112,570 housing units at an average density of 473 per square mile (183/km²). The racial makeup of the county was 61.3% (194,304) White, 21.76% (68,973) Black or African American, 0.35% (1109) Native American, 8.51% (26,974) Asian, 0.03% (95) Pacific Islander, 0.98% (3106) from other races, and 1.42% (4,501) from two or more races. About 6.0% (19,018) of the population was Hispanic or Latino of any race. 1.87% (5,940) of the population is Arab American, which is categorized as White in the US Census. There were 108,121 households out of which 31.90% had children under the age of 18 living with them, 48.30% were married couples living together, 13.10% had a female householder with no husband present, and 35.40% were non-families. 28.90% of all households were made up of individuals and 8.50% had someone living alone who was 65 years of age or older. The average household size was 2.39 and the average family size was 2.97. In the county, the population was spread out with 24.70% under the age of 18, 7.80% from 18 to 24, 32.90% from 25 to 44, 22.20% from 45 to 64, and 12.40% who were 65 years of age or older. The median age was 36 years. For every 100 females there were 88.20 males. For every 100 females age 18 and over, there were 83.60 males. The median income for a household in the county was $60,114 and the median income for a family was $75,140. Males had a median income of $40,203 versus $29,795 for females. The per capita income for the county was $26,410. About 4.50% of families and 6.20% of the population were below the poverty line, including 8.10% of those under age 18 and 4.50% of those age 65 or over. Henrico County is managed by an appointed County Manager who answers directly to the Board of Supervisors. The current County Manager is John A. Vithoulkas. In 2014, Henrico County won 'Best in Government' from Richmond Magazine. There are several elected constitutional officers. There are also several legislative representatives. The first known mention of an "officer" in Henrico was the appointment of a Special Police Officer on December 14, 1871. There is no further mention until 1908 when the Board of Supervisors recommended that a mounted patrol be used. The first major step toward today's department was in 1915 when T. Wilson Seay was appointed the first Chief of Police. When the County converted to the County Manager form of government in 1934 there were 8 police officers. In 1938 the Board of Supervisors placed the Division of Police under direct control of the County Manager, thus removing any political ties with the Sheriff's office. The Division of Police has seen steady growth and improvement over the past 70 years. With an authorized complement of 624 sworn police officers, the Chief of Police is the chief law enforcement officer in the County. The Chief is appointed by the County Manager. The elected Sheriff's primary duties are managing the jail, court security, and the service of civil process. The Henrico County Police is fully accredited by the Commission for Accreditation of Law Enforcement Agencies (CALEA) and Virginia Law Enforcement Professional Standards Commission. Colonel Henry W. Stanley, Jr., served as Chief of Police for the Henrico County Police Division from August 1995 to April 2011 when he retired after being a member of the Division since 1962. Lt. Colonel Douglas A. Middleton was appointed as the new Chief of Police effective April 9, 2011 and served until April 15, 2016. Major Humberto I. Cardounel, Jr. was appointed as the new Chief of Police effective April 16, 2016. The Division of Fire is responsible for fire suppression, emergency medical services, hazardous materials response, technical rescue, water rescue, fire prevention, fire investigation, public education, disaster preparedness and emergency management. The Henrico County Fire Department includes 548 members, of whom 526 are sworn firefighters. The division operates 68 fire apparatus at 20 community fire stations. The division is rated ISO class 1. Additionally, the department encompasses several specialized units, including a Water Rescue Team, Technical Rescue Team, Hazardous Incident Team, and special events resources. In 2014, the Division of Fire responded to 41,759 emergency incidents. Altria Group (formerly Philip Morris) had its corporate headquarters in an unincorporated area in Henrico County. In 2003 Philip Morris announced that it would move its headquarters from New York City to Virginia. The company said that it planned to keep around 750 employees in its former headquarters. Brendan McCormick, a spokesperson for Philip Morris, said that the company estimated that the move would save the company over $60 million each year. This relocation was made with the help of the Henrico County Economic Development Authority and the Greater Richmond Partnership, regional economic development organizations who also helped locate Aditya Birla Minacs, Alfa Laval, Genworth Financial, and Blue Bell Ice Cream to the county. The school division known as Henrico County Public Schools consists of 45 elementary schools, 13 middle schools, 10 high schools and 2 technical centers within one school district. In 2001, HCPS began distributing Apple iBooks to every high school student. In 2003, they extended the program to middle schools. In 2005, the HCPS School Board decided to replace the iBooks with Dell's Inspiron 600M at the High School level. In 2006, the HCPS School Board decided to continue using Apple iBooks at the Middle School level, purchasing nearly 13,000 laptops in a contract worth $15.8 million. In 2010, HCPS School Board opened a new middle school, Holman Middle School, and opened a new high school, Glen Allen High School. There are no existing incorporated towns, and no new municipalities can be created within the county. Henrico was the third Virginia county (after Arlington and Fairfax counties) to be affected by a state law that prohibits the creation of any new towns or cities within the boundaries of a county with a population density of 1,000 or more per square mile. Prior to 1870, the Town and later City of Richmond was located within Henrico County. Under a new Virginia state constitution in 1870, and as further clarified by rewritten one in 1902, Richmond became an independent city. Barton Heights, incorporated 1896, annexed by the City of Richmond in 1914. Fairmount, incorporated 1902, annexed by the City of Richmond in 1914. Ginter Park, annexed by the City of Richmond. Highland Park, annexed by the City of Richmond in 1914. North Richmond, annexed by the City of Richmond. A soybean field in eastern Henrico County, VA. Though the county is one of Virginia's largest suburban localities, parts of it also remain under cultivation. For many years, the United States Postal Service considered most of Henrico County to be unincorporated Richmond, and the majority of locations in the county had a Richmond address. However, in 2008 county residents won the right to recognize Henrico County as the locality to which they pay the majority of their taxes. As of October 1, 2008, the primary mailing address for the majority of the county was officially changed to Henrico. It was estimated that the county would recover $5 million in misdirected tax dollars due to the address change. This move has set a precedent causing many other localities in Virginia who are officially recognized by the United States Postal Service as the nearest major city to consider petitioning the United States Postal Service for their own official mailing address bearing the name of the locality to which residents actually pay their taxes. Henrico County is the location of Richmond Raceway, which is home to Monster Energy NASCAR Cup Series races twice a year. Henrico County is the county that handles hazardous material spills and related problems (with three HAZMAT Teams) for the entire Central Virginia Region. Partly because of this, Central Virginia has total interoperability of Emergency Communications (Police, Fire, Recreation and Parks, Volunteer Rescue Squads, etc.) between the cities and more than ten counties. Henrico County has the highest bond rating (Triple, triple-A) from the three bond rating agencies in the United States, which means Henrico is known nationwide for its solid fiscal responsibility. Henrico County residents are served by the Henrico Area Mental Health and Developmental Services, which has a CARF three-year accreditation. All fees for services rendered are based on financial need, providing mental health and recovery support services to thousands who otherwise would not be able to afford this due to their own limited financial resources. Nobody is denied service due to an inability to pay. ^ a b c Henrico County. "Henrico Becomes a Shire". ^ a b c d e f Henrico County Public Schools. "Henrico and the Land Around Us" (PDF). Archived from the original (PDF) on 28 October 2014. Retrieved 28 October 2014. ^ a b "Commonwealth of Virginia Official 2015 Population Estimates". Virginia Weldon Cooper Center. Archived from the original on March 16, 2015. Retrieved May 2, 2015. ^ U.S. Census Bureau. "Henrico County Quickfacts". Archived from the original on 2011-07-11. ^ a b c d Henrico Historical Society. "Henrico History". ^ "About Richmond Raceway - Richmond Raceway". www.richmondraceway.com. Retrieved 2017-09-20. ^ Virginia Employment Commission. "Virginia Community Profile: Henrico County" (PDF). Retrieved 28 October 2014. ^ Henrico County. "Henricus". Retrieved 28 October 2014. ^ Henricus Historical Park. "1611 Settlement". Archived from the original on 25 October 2014. Retrieved 31 October 2014. ^ Richmond Department of IT. "Annexation History Map". Retrieved 3 November 2014. ^ a b Kollatz, Harry. "Irreconcilable Differences". Retrieved 2 November 2014. ^ Adkins, Sandy. "Countdown to Jamestown #9" (PDF). Retrieved 3 November 2014. ^ Henrico County. "Varina Magisterial District". Retrieved 30 October 2014. ^ "Climatological Information for Tuckahoe, Virginia", USA.com, 2003. Web: . ^ "Henrico County, VA - Henrico County, Virginia - Ancestry & family history - ePodunk". www.epodunk.com. Retrieved 2 December 2017. ^ "Best & Worst: Game Changers". Richmond Magazine. Richmond Magazine. Retrieved 10 June 2015. ^ Leip, David. "Dave Leip's Atlas of U.S. Presidential Elections". uselectionatlas.org. Retrieved 2 December 2017. ^ "Fire - Henrico County, Virginia". henrico.us. ^ "Contact Us Archived 2009-10-11 at the Wayback Machine." Altria Group. Retrieved on October 19, 2009. ^ "County of Henrico CAFR" (PDF). Retrieved 2 December 2017. ^ "Henrico County, Virginia (VA)". City-Data.com. Onboard Informatics. Retrieved 23 April 2016. ^ "Code of Virginia § 58.1–3260". Commonwealth of Virginia. Retrieved 23 April 2016. ^ "Henrico Virginia". Retrieved 2008-05-29. ^ "Henrico Finance Department, Accounting Division". Retrieved 2011-04-25. ^ "CARF". Henrico County. Henrico County. Retrieved 11 June 2015. ^ "Henrico Area Mental Health & Developmental Services". Archived from the original on 2011-03-18. Retrieved 2011-03-07.